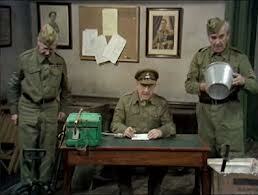 The Dad’s Army excerpt from the 1969 Noel Coward Revue was for a long time a little-seen part of the series archive. For many years copies of it resided in the BBC and Dad’s Army Appreciation Society’s archives but were not widely available. The revue, a tribute to the Sir Noel Coward, was recorded in November 1969. Three members of the Dad’s Army cast – Arthur Lowe, John le Mesurier and Clive Dunn performed Coward’s 1943 song Could You Please Oblige Us With A Bren Gun – which could easily have been the show’s theme tune, so closely did its lyric mirror the tribulations of the Walmington-on-Sea platoon. The excerpt has now been released on DVD and can also be seen on Youtube – and here at Walmington-on-Line we think it is one of the most charming of the Dad’s Army side ventures. This entry was posted in blog on October 27, 2013 by wolAdmin.